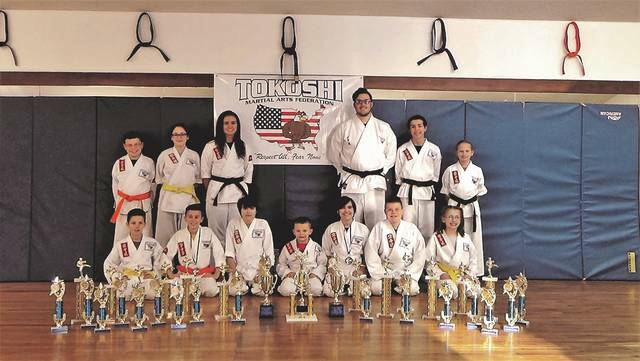 Students from the Dogwood Ridge Tokoshi Martial Arts Dojo participated at the AKJU 50th Anniversary Ohio State Karate, Ju-Jitsu and Iaido Championship in Chillicothe, Ohio on March 24 and April 15th, as well as the annual Cobra Karate Championship in Jackson, Ohio on April 7. Pictured in the front row, from left to right: Joshua Lawson, second, Kata (Jackson), Nicholas Sylvia, first, Kata (Chillicothe and Jackson), first, weapons (Chillicothe and Jackson) and third, Kumite (fighting) in Jackson, Oksana McWharter second, Kata (Jackson), Carson Campbell, second, Kata and first, fighting (Chillicothe), Payton McWharter, third, Kata, and first, fighting (Jackson), Trevon King, second, Kata, first, weapons and first, fighting (Jackson) and Sydney Little, first, Kata and first, weapons (Jackson). In the back row, from left to right: Jonathan Bailey, second, Kata (Chillicothe), Megan Conley, first, Kata, second, weapons, and first, fighting (Jackson), Victoria Thomas, second, Kata, first, weapons, first, fighting and Grand Champion Women’s Black Belt division in fighting (Chillicothe), Chase Wagner, second, Kata (Chillicothe), first, Kata and Grand Champion Men’s Black Belt Division for Kata (Jackson), third, weapons (Chillicothe), first, weapons and Grand Champion for weapons (Jackson), first, fighting Men’s Black Belt (Chillicothe) and second, fighting (Jackson), Alexander Thomas (Chillicothe), and Staci Lansky, first, Kata, and third, fighting (Chillicothe), and Kayla Sammons (not pictured) first, Kata, weapons and fighting (Jackson). Students from the Dogwood Ridge Tokoshi Martial Arts Dojo participated at the AKJU 50th Anniversary Ohio State Karate, Ju-Jitsu and Iaido Championship in Chillicothe, Ohio on March 24 and April 15th, as well as the annual Cobra Karate Championship in Jackson, Ohio on April 7. Pictured in the front row, from left to right: Joshua Lawson, second, Kata (Jackson), Nicholas Sylvia, first, Kata (Chillicothe and Jackson), first, weapons (Chillicothe and Jackson) and third, Kumite (fighting) in Jackson, Oksana McWharter second, Kata (Jackson), Carson Campbell, second, Kata and first, fighting (Chillicothe), Payton McWharter, third, Kata, and first, fighting (Jackson), Trevon King, second, Kata, first, weapons and first, fighting (Jackson) and Sydney Little, first, Kata and first, weapons (Jackson). In the back row, from left to right: Jonathan Bailey, second, Kata (Chillicothe), Megan Conley, first, Kata, second, weapons, and first, fighting (Jackson), Victoria Thomas, second, Kata, first, weapons, first, fighting and Grand Champion Women’s Black Belt division in fighting (Chillicothe), Chase Wagner, second, Kata (Chillicothe), first, Kata and Grand Champion Men’s Black Belt Division for Kata (Jackson), third, weapons (Chillicothe), first, weapons and Grand Champion for weapons (Jackson), first, fighting Men’s Black Belt (Chillicothe) and second, fighting (Jackson), Alexander Thomas (Chillicothe), and Staci Lansky, first, Kata, and third, fighting (Chillicothe), and Kayla Sammons (not pictured) first, Kata, weapons and fighting (Jackson).